I spent Tuesday evening online ordering some of the fixtures for the new bath. Shopping around for the best price takes time but beats the hell out of driving round visiting every plumbing supply store and bath showroom in a twenty mile radius to find a Tenso faucet. And that was after I'd visited the Grohe website to locate the dealers. Every one could show my a picture in a catalogue but no one had the model in stock. I'd seen the faucet on the website and had the dimensions but I wanted to see it in real life. I wanted to see how shiny it was, how big, how bulky. After a really frustrating four hours and nearly half a tank of fuel I gave up, came home and started searching online suppliers. By 5:00 pm I had not only ordered the faucet but a matching shower valve trim and a Freehander shower. Then I moved on to the vessel sink. 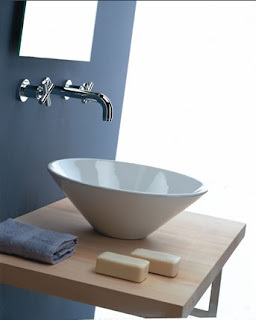 I'd wanted a bronze tempered glass sink but I was concerned that the color might not be as pictured on the websites and once again I couldn't find anyone locally who had anything in stock - not even the snotty hardware store in Nassau County, NY where the salesman's first question wasn't "Were you looking for glass, ceramic or stone?" but "How big is your budget because we only deal in expensive sinks, we're a high-end store, that's what our clientele demands." (note to self: wear a huge diamond ring and borrow Louis Vuitton bag when shopping in Great Neck). He showed me a bunch of catalogs and gave me a price on a glass vessel that I could beat by $180 elsewhere. Superb customer service. I identified a cute Italian ceramic vessel sink at Qualiytbath,com, emailed them about lead times, had a reply within 10 minutes saying it would ship 5-7 days after the order was placed, ordered it at 5:30 pm and it arrived by UPS at 3 pm yesterday. Less than 24 hours, free shipping and no sales tax. Oh, and no snotty salespeople of course. I rounded off the evening by ordering the towel racks, toilet roll holders, robe hooks and finally a Toto Maple Softclose Toilet Seat. Just to prove that I can shop locally without feeling like I'm wasting the salesperson's time, I ventured out again to look at lights and had lots of help from The Lighting Gallery in Huntington. I explained what I was looking for and was directed to contemporary vanity lights. A few questions later and I had the perfect solution: a bar light that won't detract from the mosaic tile but will still make a statement and will fit in with the style of the house. I did have to pay NY sales tax but I got excellent service and I got to feel the merchandise too. It's all coming together at last. Today, before 9:30 am FedEx dropped off the faucet and shower. The trim is promised, via the wonderful UPS tracking system, for Monday, the other things by the end of the month. The plumber is getting the actual toilet for me and the Grohe shower valve and now he, the handyman, the other contractor, my husband and myself have all agreed on the dimensions of the shower I can go ahead and order the base, safe in the knowledge that five people can't be wrong. Can they?